Could China's AIIB Be a Game-Changer for North Korea? Possible membership in the AIIB could incentivize needed reforms in North Korea. The surprisingly robust emergence of the Asian Infrastructure Investment Bank (AIIB) through its recruitment of 57 founding member countries has transformed prospects for economic cooperation in Asia. The AIIB promises to become a credible multilateral financial institution capable of funding significant infrastructure projects across the region. North Korea potentially stands to benefit if the bank’s forthcoming membership requirements allow Pyongyang a path to participation and if the government can someday clear transparency and other administrative hurdles. Borrowers in Asia should welcome the AIIB as a new lending instrument. Private investors have proven unable to contend with the scale and diversity of infrastructure needs across countries where varying domestic conditions pose challenges. The World Bank and Asian Development Bank have prioritized poverty reduction and tailor country assistance programs to a variety of critical social, environmental, and economic development needs, which limits their capacity to finance infrastructure projects. The AIIB appears poised to fill a crucial gap by focusing its multilateral heft exclusively on infrastructure needs in its member states. The AIIB’s membership and governance framework has been under discussion by the founding members. A three-day meeting in Singapore that ended May 22 adopted proposed voting shares and draft Articles of Agreement for formal signing that is now planned for late June. It is expected to begin operations by the end of 2015. Because the U.S. and Japan chose not to join the AIIB as founders, it is possible that the bank may choose its own selection criteria for future members that would not require prior membership in the IMF, where Washington and Tokyo have the power to block a bid for entry. It is thus possible to imagine a potential entry mechanism for North Korea that would not be subject to a U.S. or Japanese veto. Even if there were an absence of political obstructions, North Korea would not have easy entry to the bank. In fact, North Korea reportedly made informal inquiries about becoming a member, and came away discouraged because it could not provide key information on its economic and financial conditions. That leaves open the question of what membership criteria may make North Korean participation in the bank an eventual possibility. The AIIB could potentially handle future membership applications like the European Union (EU) and the World Trade Organization (WTO), which each possess minimum threshold standards for national financial and economic reporting, macroeconomic management, financial system development, legal system development, labor market policies, and other factors as a baseline for membership eligibility. Creating such standards within the AIIB would establish a positive incentive for reform in North Korea. The EU and WTO each assist prospective member states in meeting their accession standards, and the AIIB could offer similar technical assistance for nations such as North Korea in establishing the policies and economic management capacity required for membership. North Korea signaled potential openness to such multilateral engagement when it agreed to join the Asia Pacific Group (APG) on Money Laundering as an observer. As part of the recent decision, Pyongyang committed to undertake financial reforms that would bring it into compliance with APG’s standards for anti-money laundering and terrorist financing. This move, which included establishment of an inter-agency steering group for its compliance efforts, showed that North Korea can be motivated in some cases to alter its financial practices in accordance with international rules. North Korea recently appointed a finance minister who is particularly versed in international financial issues, a possible sign of interest in further multilateral cooperation. Ki Kwang-ho previously served as vice minister of the Finance Ministry and director of its External Finances Department; in those roles, he helped respond to U.S. financial sanctions against Banco Delta Asia and negotiated terms for settling the North’s debt to Russia. Like the IMF, World Bank, and Asian Development Bank, the AIIB will need detailed information on the economic and financial condition of new applicant states to determine their voting powers and financial commitments within the organization. Providing that information will be both a political and technical challenge for North Korea if it wishes to pursue membership and demonstrate national creditworthiness to borrow for infrastructure projects. If obtaining financing for infrastructure investment is the driving motivation for North Korea to join the AIIB, the country will also need to follow the institution’s policies and procedures to access funding, bid competitively for goods and services through AIIB-compliant contracts, and permit foreign participation and supervision in specific infrastructure projects. All of these demands would be a very heavy lift for North Korea at present, so it is not surprising that initial overtures of interest were met by hesitation, if not outright denial, on the part of the Chinese officials involved in establishing the bank. In addition, the overhanging shadow of North Korea’s nuclear program, its provocations towards South Korea, and the existing sanctions regimes applied to North Korea all pose formidable political obstacles to North Korean membership in the AIIB. While the U.S. and Japan are not founding members directly involved in shaping the AIIB’s governance framework, their views on a potential relationship between North Korea and the AIIB will carry considerable weight. Future U.S. and Japanese cooperation with the AIIB may depend on how the bank handles this question. The U.S. could even target the ability of companies and banks in AIIB member countries to do business in North Korea, by invoking financial sanctions under existing or future executive orders and legislation. It thus seems unlikely that an independent bid by North Korea to join the AIIB will be feasible in the foreseeable future. 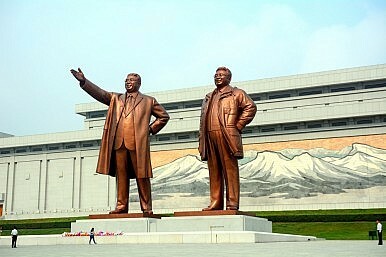 Still, it is possible to imagine a two-pronged approach to advance Pyongyang’s readiness for eventual membership by both technical and political means. A gradual, phased approach could begin by according North Korea an observer status within the AIIB. Such a step would allow North Korea to learn how the AIIB conducts normal business and why the bank adopts certain governance policies and operational procedures. A supplementary technical assistance program could help the North Korean government to address policy and capacity obstacles to its eventual membership in a step-by-step manner, and also to demonstrate a commitment to internationally-backed economic and financial reforms. A second phase could aim to build confidence in developing an operational relationship between North Korea and the bank, both by helping the country to prepare projects for potential financing and by funding some smaller North Korean initiatives with grants. Membership and access to loan financing would come when North Korea satisfies all of the necessary technical and political conditions for AIIB membership. A second track would address North Korea’s nuclear and missile programs through a new round of Six Party Talks, or with a successor framework for reducing the nation’s threats to the global nonproliferation regime and regional security. Participants could link progress in the political talks to support for advances in the relationship between North Korea and the AIIB, and potentially also to the country’s prospective membership in the IMF, World Bank, and Asian Development Bank. By supporting a process that would nurture North Korea’s involvement with the AIIB in a way that would win broad support, Seoul would further its own long-term interests in seeking stability on the peninsula and gradual integration. Inter-Korean economic relations have soured since the shelling of Yeonpyeong Island and the sinking of the Cheonan in 2010. Both countries profess to seek improved relations and expanded economic ties, but they confront domestic and international constraints in pursuing a reinvigorated inter-Korean agenda. South Korea has long advocated establishing a Northeast Asia Development Bank, and the AIIB goes a long way toward fulfilling that dream. Advancing North Korea’s regional integration through the AIIB would reward it with a meaningful economic incentive that could also help advance the cause of dealing with serious security challenges. By helping Pyongyang to fund infrastructure that it badly needs for economic growth, the bank could help advance discussions in political talks on security issues — not just on nuclear issues but also in creating a multilateral framework for Northeast Asia — and potentially through creating greater economic interdependence with other state participants in AIIB programs. International funding of North Korean infrastructure projects would eliminate certain constraints to expanded investment and trade, and an eventual relaxation of sanctions could even further increase North Korea’s participation in the global financial system. The U.S. and Japan should seriously consider welcoming North Korean engagement with the AIIB as a first step, if only for the bank’s potential to offer Pyongyang meaningful new incentives to take concrete actions that would address international concerns about its nuclear and missile programs. A careful international strategy could thus leverage the AIIB as a new tool for productive engagement with North Korea. By establishing infrastructure development assistance as an incentive for Pyongyang to carry out political and economic reforms, the bank could contribute toward security and economic outcomes beneficial to North Korea and its neighbors. Bradley O. Babson is a consultant on Asian affairs with a focus on Korea and Northeast Asia economic cooperation. He is retired from a career at the World Bank, with a concentration in East Asia. Can North Korea's Economy Endure China’s Slowdown?North Korea’s Internal Struggles Hint That Sanctions Are WorkingWhat’s Behind North Korea’s Recent Efforts to Promote Its Education Sector?Demystifying Debt Along China’s New Silk RoadHow Does North Korea's Economy Look Heading Into the Hanoi Summit?